His great talent has earned the young cellist Christian Poltéra a place in no less than three schemes designed to raise the profiles of up-and-coming musicians, namely the BBC New Generation Artistscheme, the Borletti-Buitoni Award and the ECHO Rising Star programme. This has given him the opportunity of meeting concert audiences all over Europe, and now – in a three-disc series on BIS – he will be reaching even further afield. On these three discs, Poltéra, a native of Switzerland, has chosen to perform cello works by three Swiss composers, namely Othmar Schoeck, Arthur Honegger and Frank Martin. Each disc will consist of a concerto coupled with various chamber works, in which Poltéra is joined by illustrious musicians such as Christian Tetzlaff and Kathryn Stott. In each case the orchestral scores are entrusted to the Malmö Symphony Orchestra and conductor Tuomas Ollila. Othmar Schoeck (1886-1957), the first composer in the series, wrote a large number of songs and vocal works. But he also had a special relationship with the cello, as testified by his habit of running through sketches for his works with his brother – an amateur cellist – performing the vocal line. 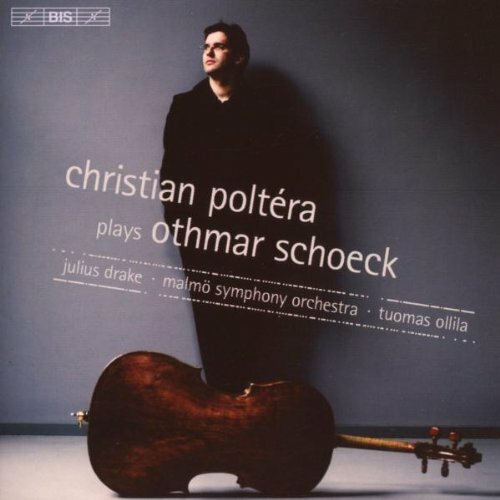 It is therefore fitting that Christian Poltéra has chosen to include six songs by Schoeck in his programme, performing them with pianist Julius Drake, who has made Lieder a main concern of his career. The concerto which opens the programme also betrays Schoeck’s preoccupation with the human voice: while the cello’s bold opening statement in the first movement is demonstrably instrumental in conception, the solo instrument is soon ‘singing’ long melodic lines. Some ten years after completing the concerto, the composer revisited the same territory in a sonata which was to become his final work. (In fact, he passed away before being able to complete the projected fourth movement of it.) The Sonata and the Concerto are close stylistically, and echoes of the concerto can be found in the later work – the coda of the sonata’s first movement, for example, quotes almost directly from the first movement of the concerto.